This time of the year I am prone to write about frigid February weather. Growing up in Indiana this would be the time of year for -20 wind chills and blizzards. Today we are holding meetings on the Boatwright Patio in shirtsleeves and going for warm, sunny walks around the lake. Times change. Libraries change as well. We have a new staff member, LaToya Gray, in our User Services Department and a new oldest item in our Galvin Rare Book Room. 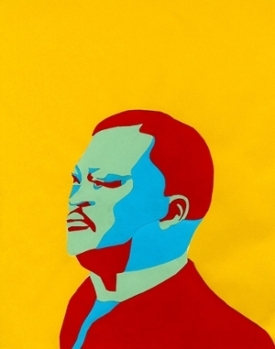 Along with these changes we celebrate the ten-year anniversary of our Podcasts@Boatwright series and Early Civil Rights Leaders in Richmond, an exhibition aided by Boatwright's Book Arts Studio. The Spring semester is well underway! During the summer of 2018, Boatwright Library acquired a new item which moves the collection’s “oldest item” dates back by a few centuries. Previously, the oldest items within the Rare Books & Special Collections holdings was the 1470 book, Praeceptorium divinae legis sive Expositio decalogi and the oldest manuscript, a handmade devotional book, dating between 1471 and 1512. Found at Jokha, the ancient Umma in central Babylonia, the tablet lists provisions supplied to the temple messenger while traveling to collection offerings for the temple. The list mentions quantities of oil, meat, dates, and grains, among other materials. The date is noted on the edge written in fine characters. 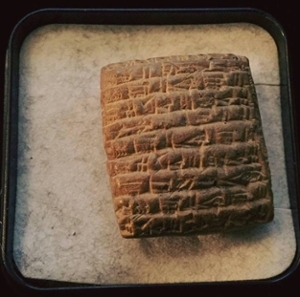 This messenger tablet dates from 2350 B.C.E. and is currently on display in the Galvin Rare Room through April 2019. Hope, Faith, and Courage: Early Civil Rights Leaders in Richmond, an upcoming exhibition at UR Downtown, celebrates early civil rights activists in Richmond and explores their life and leadership in a local, national, and international context. University of Richmond students in “Representing Civil Rights Richmond,” a First-Year Seminar taught by Professors Laura Browder and Patricia Herrera, selected key individuals, organizations and moments at the height of Jim Crow segregation to study and worked with Jen Thomas, Book Arts Program Director, to create colorful cut-paper portraits of these individuals and events. She also worked with Open High School students in two U.S. History courses taught by Chad Ingold, recipient of a 2018-19 Partners in the Arts Emerging Creative Thinkers Project Award, to create additional portraits for the exhibition. The cut-paper portrait process begins with an original photograph. Students then use tracing paper to outline the image, breaking it down into light, medium and dark tones. Once outlined, they then use 3 tones of color paper to bring out different elements of the face and to create a personalized representation of the individual. In addition to cut-paper portraits, Jen and her student assistants, Cindy Ochoa and Jacquelin Park, designed, carved, and printed 11 linoleum block silhouettes representing these important figures and events highlighted in the exhibition. These images will line the hallway leading into the main gallery space at UR Downtown. By creating colorful portraits and linoleum block prints drawn from nineteenth and early twentieth century black-and-white photographs for this exhibition, University of Richmond and Open High School students honor the individuals who helped shape our city and who launched the fight for equality that defined mid-twentieth century America. LaToya Gray is a new User Support Specialist in Boatwright Library. She comes to this position from the University of Richmond School of Law. LaToya’s background consists of experience in government affairs and public relations, with previous positions at the Supreme Court of Virginia, Virginia General Assembly and the Office of the Attorney General. 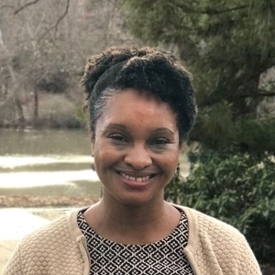 Outside of work, LaToya is currently serving as an Advisory Council member for Richmond 300, a committee working on the City of Richmond’s 2020 Master Plan. For fun, LaToya loves singing and was in a production of Godspell at the Modlin Center. During the winter of 2008-2009, Andy Morton, Web Technologies Librarian and Lucretia McCulley, Head of Scholarly Communications, were experimenting with iPod technology in the library and brainstorming applications. One idea that emerged was to interview faculty members about their new publications. As the liaison librarian for the Jepson School of Leadership Studies, Lucretia was working closely with Dr. Doug Hicks on his new book, With God on All Sides: Leadership in a Devout and Diverse America. 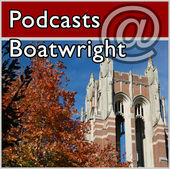 Dr. Hicks was a willing interview participant and on February 9, 2009, Podcasts@Boatwright was launched. To our surprise, podcasts grew in great popularity and ten years later, Podcasts@Boatwright is still conveying faculty stories about new scholarly publications. The library has produced over 60 interviews with faculty, focusing on new books, journal articles and other research. Faculty enjoy learning about their colleagues’ research and students have written about the podcast series in The Collegian and other student publications. Listen and learn at: https://boatwrightpodcasts.urlibraries.org/. You can also suscribe in iTunes.